Appearance: Maximillaion Pegasus is a very rich man, wich is the reason for his formal wear of fancy looking red suits & outfits. He has ong, grey hair that reaches his shoulders. His left eye was replace by the legendary "Millenium Eye," an ancient artifact that belongs to the other 6 of the "Millenium Items" of ancient Egypt. Personality: Pegasus is depicted as a well-mannered, yet overly dramatic man obsessed with cartoons, concealing the appearance of a ruthless businessman and gamer, yet man of his word. Pegasus has a habit of calling Yugi "Yugi-boy" and Kaiba "Kaiba-boy". When sufficiently provoked, he can have a temper. Pegasus is also notable for his foppish manner, dandified appearance, and effeminate hairstyle, all of which have led to him being referred to as "cutie-pie" and an "overdressed prima donna." Pegasus is interested in cartoons like Looney Tunes, especially Bugs Bunny, which he watched every Saturday morning while growing up in America. Cartoons are the inspiration for many of his Duel Monsters cards, such as "the Toon Monsters." 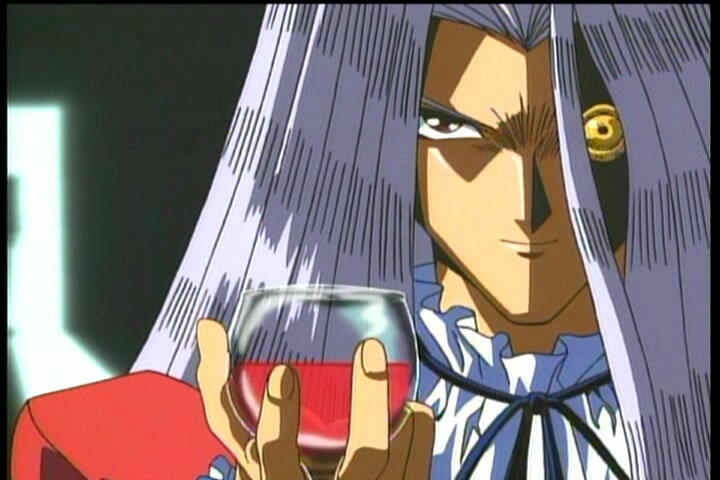 Biography: Pegasus was born in Britin where he lived a good live until he first met Cecelia at a party thrown by his businessman father in Las Vegas 14 years before Duelist Kingdom. The two fell in love and made plans to live together. Pegasus often spent time painting portraits of her. Cecelia died of illness at the age of 17 & poor Pegasus was heartbroken. Pegasus searched the world looking for anything that could possibly revive the dead, wich never works. His quest led him to Egypt, where their beliefs of an afterlife intrigued him. Here he met Shadi, the guardian of the legendary Egyptian artifacts, the "Millennium Items". Shadi warned him that he wouldn't find the solutions to his problems here and tells him to leave. Pegasus is impressed as he thinks Shadi just read his mind. He ignores Shadi's warning and follows him to an underground temple. After Shadi realizes Pegasus followed him, he puts him to the "Millenium Eye's" test. If Pegasus was worthy of the Eye, he would be granted his dearest wish, which was to see Cecelia again. Pegasus has his left eye replaced with the Millennium Eye, which Shadi forced into Pegasus' left eye socket. After receiving the eye, Pegasus beleived to have saw a vision of Cecelia for a brief moment, enough to hug her before returning to reality. Pegasus soon learned of the ancient Shadow Games that were played in ancient Egypt and became obsessed with their "powers." Having created Industrial Illusions, he started a new game in the United States, Duel Monsters, a card game based on the duels of ancient times. Combining the "magic" of the Millennium Items with these cards had the same effect as using them with the stone slabs originally used. After the creaton of Duel Monsters came the the creation of dinosaurs. Pegasus then became interested in dinosaurs & came up with a fabulous idea, to create an island in the Atlantic Ocean, where JFC-like tournaments can be held as well as a Duel Monsters tournament as well. The 1st place winner would receive $100,000 as the grand prize, & the 2nd, 3rd, & 4th place winners receives $25,000. Now, he resides on his island, wich he has named Duelist Kingdom, & waits to send out invitations to people, so they can participate in these tournaments.